Blessed François de Laval was born at St. Martin de Montigny-sur-Avre, Normandy, France. He wanted to become a priest from his earliest childhood. When he was eight years old, his father placed him with the Jesuits, where he lived for fourteen years far from his family. François lost his father in 1636. His uncle, a bishop, appointed him a canon of Evreux to assist his family. He was ordained a priest on May 1, 1647. King Louis XIV chose him as the first Bishop of New France. On December 8, 1658, the feast of the Immaculate Conception, the thirty-eight year old prelate was consecrated a bishop. He left for Quebec on June 16, 1659, and immediately began making pastoral visits throughout his immense diocese. Upon his arrival, he won everyone's confidence with his charity, piety, discernment and impartiality. His first concern consisted in advancing the organization of the Church in Canada. He contributed greatly towards both the civil and religious formation of the country. Even though he had to face many difficulties, with his wise, firm action, he succeeded in implanting the Faith all over North America. Bishop de Laval first founded the Seminary of Quebec which gathered together a community of priests; in 1663 he entrusted the formation of his clergy to this seminary. Five years later, a Minor Seminary was opened for the recruitment of his clergy. In conformity with holy practice in the early centuries of the Church, all the clerics and churchmen lived out of a common fund. 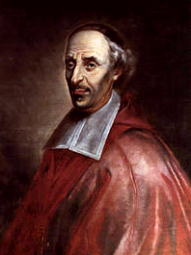 Blessed François de Laval had to fight with all his might against disorders that had been introduced into the country at the beginning of its colonization, chiefly the traffic of intoxicating liquor. Saint Mary of the Incarnation wrote, The bishop has had many conflicts in New France concerning liquor given to the natives which almost led to the total ruin of this new Church. Thanks to his apostolic zeal, this shameful commerce was absolutely forbidden. The secular powers raised serious opposition to his evangelizing activities, but Bishop de Laval never capitulated in the face of his adversaries' odious proceedings. With firmness and perseverance, the holy bishop resisted all encroachments of civil authorities in Church government. He rose up with authority against anyone who wanted to hinder the implantation of Christianity in the blessed land of New France. With supreme patience, he endured all the wicked actions that earthly magnates wrought against him, as well as two major fires that demolished his seminary, for which he had labored so hard. This holy bishop, a pioneer of the Church in New France, lived in constant, heroic renouncement. He wore a hair shirt and slept very little, so as to be able to pray all his offices and rosaries. As for the brief rest he granted himself, he took it on a wretched mat laid on a bed of boards, without even a sheet to cover himself. His great evangelical simplicity was also very praiseworthy, for never did any man have a greater horror of showmanship and vanity, especially when it presented itself under a cover of religion. This worthy, virtuous prelate wore old, patched garments. For twenty years he owned only two winter cassocks. At his death one of them was still good; the other, threadbare and patched, attested to his wonderful spirit of poverty. Hard on himself, this admirable man of God was prodigal to excess towards Christ's poor. Every year he never failed to give the needy 1,500 to 2,000 pounds. Blessed François de Laval endured the sufferings of his last years with great serenity and resignation to God's will. During Holy Week in 1708 he contracted the illness that was to take him to the grave. On May 6, 1708, he died in the company of his priests, reciting the Rosary and the Litany of the Holy Family, which devotion he had propagated throughout Canada.